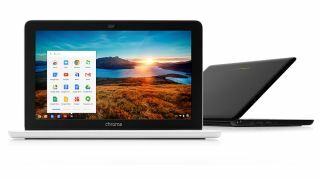 Google has teamed up with Citrix to deliver business-critical Windows apps to Chromebooks, addressing one of the key issues for the clamshell devices. The duo will combine Chromebooks for Business, Citrix XenApp, and Citrix Receiver for HTML5, which will allow the delivery of a variety of Windows apps to Chrome-based systems. XenApp already hosts millions of Windows applications, while Citrix also offers a number of Chrome-friendly web-based apps, such as GoToMeeting Free for video conferencing. As a further push for Chromebooks, Citrix is offering 25 per cent off XenApp Platinum edition up to September 30 of this year. The Platinum edition includes AppDNA to help simplify and speed up migration from Windows XP to a newer and safer operating system. While Chromebooks initially failed to take off, that has changed in recent months. Chromebooks accounted for almost ten per cent of all laptop and tablet sales in 2013, and that number is likely to grow. The lack of essential Windows apps has been one of its drawbacks, making this partnership an important one for pushing Chromebook adoption in the business sector. VMware has also offered a similar solution. "Enterprises have been steadily adopting Google Chromebooks as an easy-to-use and cost-effective alternative to traditional computing platforms. Citrix and Google have been working together since 2010 to ensure our customers have access to enterprise-critical Windows apps in the Chrome environment," said Amit Singh, President of Google Enterprise. "The approaching Windows XP end-of-life brings a tremendous opportunity for organizations of all types to rethink their approach to computing and transition to Chromebooks for improved manageability, security and cost savings." Support for Windows XP expired on April 8.